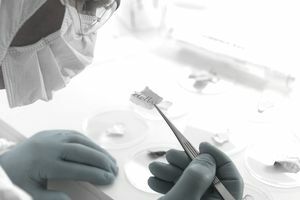 Forensic document examiners, also known as questioned document examiners (QDEs), are forensic scientists who help solve crimes by verifying the authenticity of documents. The Southeastern Association of Forensic Document Examiners defines a document as "anything that bears marks, signs, or symbols which have meaning or conveys a message to someone." That means that the types of items a document examiner may be called upon to analyze are virtually limitless. Some of the most common types of fraud that fall under the purview of forensic document examiners include lottery tickets, wills, bank records, and letters. Nearly every transaction of any consequence requires documentation of some sort, through contracts, checks, financial records, and more. With this documentation comes a vast potential for fraud and deception through forgery and the production of false records. Forensic documents examiners help identify the veracity of those records when their authenticity comes into question. They assist attorneys and criminal investigators, and they may work closely with forensic accountants and agencies that investigative financial fraud, such as the United States Secret Service. Some forensic document examiners specialize in determining the authenticity of ancient and historical texts. Historians, archaeologists, and anthropologists may call upon experts to identify the age or author of seemingly historically significant documents. Education: Forensic document examiners must have earned at a minimum a bachelor's degree in one of the natural sciences. Training: They must then complete a minimum of two years of formal training in an apprenticeship under an expert examiner. Testing: Document examiners must have excellent eyesight and must undergo vision tests including the ability to distinguish forms, colors, and distances. Detailed analysis: Forensic document examiners need the ability to discern and perceive subtle differences between items, such as handwriting samples, paper types, and inks. Communication skills: They must be able to testify in court if needed and explain their findings verbally and in writing to law enforcement officials and others. Critical thinking skills: Forensic document examiners must use their best judgment when examining documents and matching them to sources. The U.S. Bureau of Labor Statistics projects that employment for forensic science technicians, in general, will grow 17 percent from 2016 to 2026, which is much faster than the 7 percent average for all occupations during the same period. However, the job market is tight because it's a relatively small occupation. Finding work as a document examiner is largely done through networking and building contacts, which can be accomplished during the apprenticeship period. Forensic documents examiners work primarily in office settings and laboratories. They may work for a private investigative firm, an attorney's office, or a government agency. They may also be asked to appear in court. Forensic documents examiners usually work a standard work week, but they may work outside of normal business hours for special cases.